Origin and Habitat: Argentina (Misiones); Brazil (Goiás, Mato Grosso, Mato Grosso do Sul, Minas Gerais, Paraná, Rio de Janeiro, Rio Grande do Sul, Santa Catarina, São Paulo). Its reported occurrence in Bolivia (Yungas;) needs to be confirmed. This is not an abundant species that tends to be more common in the southern parts of its range. In the north the species is rare, and now only known from protected areas. Altitude range: Lepismium houlletianum occurs from 300 to 1,900 metres above sea level. Habitat and Ecology: This is a southern humid forest element, it grows as an epiphyte on trees and on exposed rock walls and cliffs in the Atlantic forest, in both coastal windswept mountains (including mata de neblina) and far inland together with bromeliads and epiphyte orchids. The forests in the northern part of its range are being cleared for expanding agriculture (sugar cane) and expanding urban areas. Description: Lepismium houlletiana (Rhipsalis houlletiana) is a very popular free-flowering, copiously-branched epiphyte, with long arching stems often reaching more than 1.5 metres in length. The older stems are stiff and cylindrical, only about 0.5 cm thick, but the the joints are leaf-like and are often referred to as leaves. These flattened stems are slender and leathery, pale fresh green in colour and sometimes tinged reddish. They are up to 20 cm long and just about 3 cm wide, the margins roughly toothed. Lepismium houlletiana is one of the most reliable for flowers and the stems may produce a mass of creamy-white flowers, very faintly tinged with yellow. This form has reddish bases to the stamens, giving the flower a coloured throat and blossoms at almost any time of the year with red fruit to follow. 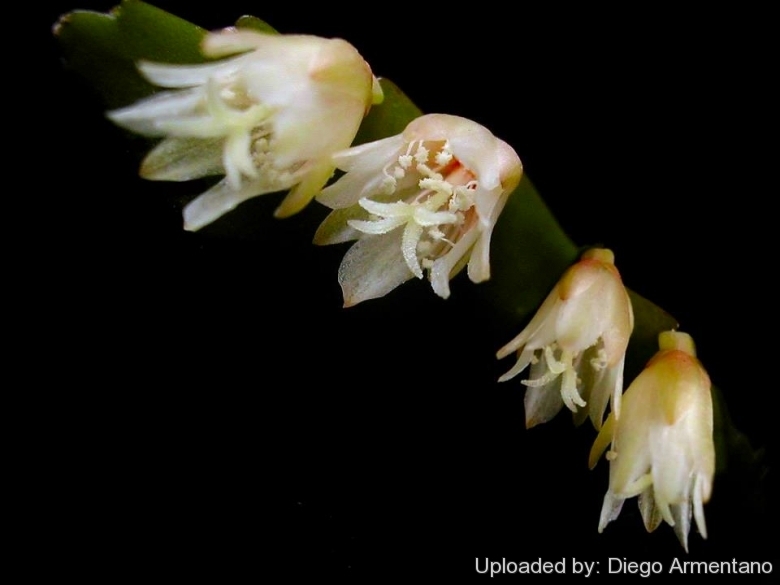 The bell-shaped flowers are 1.5-2 cm long and nodding, and the common name of snowdrop cactus is fully justified. This species is well-known and easily recognized, though rather variable in its dimensions, form and colour. Derivation of specific name: The species was named in honour of its discoverer M. Houlletia (1811-1890), French physician and botanist who imported this species from eastern Brazil. Stems: Shrubby, 1 to 2 meters long, slender, initially cylindrical, terete, 2-5 mm in diameter below, but flat, and broad above. Branches lanceolate, leaf-like, thin, 10-20 cm long, 1-5 cm broad and 2-3 mm thick, tapering into a petiole-like base, pale fresh green becoming dull dark olive green to glaucous; margin usually serrate (deeply saw-toothed), rarely crenate, teeth 20-30 mm long and 10 mm high, curved or straight. Areoles: The areoles, from which the flowers are produced, are in the notches between the teeth. They are about 1-2 mm long, white tomentose without bristles or spines. Flowers: Numerous at practically every areole and all open at once, pendulous, 1.5-2 cm, actinomorphic (radially symmetrical), broadly funnel-shaped to almost campanulate with a red eye. Outer perianth segments narrowly lanceolate, pointed, externally yellowish cream. Inner perianth segments broadly lanceolate, rounded to acute, cream-colored, turning pale yellow, up to 12 mm long. Stamens numerous cream coloured with reddish bases, anthers and stigma yellow. Ovary not sunken in the branch, shortly cylindrical, about 3 mm long, strongly 4 to 5-angled. Floral tube very short. Flower-buds squarish or pentagonal. Blooming season: It may bloom several times almost in every month of the year depending on growing conditions. Fruits (berries): Not angled, globose, juicy, translucent, red, dark red or black, 5 to10 mm in diameter. Seeds: About 1 mm large, tear-drop shaped, shiny black. Lepismium houlletianum (Lem.) Barthlott: has creamy-white flowers with reddish bases to the stamens, giving the flower a coloured throat. Distribution: Argentina, Brazil and (maybe) Bolivia. Lepismium houlletianum var. regnellii (G.Lindb.) Barthlott & N.P.Taylor: This form has plain creamy flowers, the stamens lacking reddish colouration. Distribution: Minas Gerais, Brazil. 2) Taylor, N.P., Zappi, D. & Braun, P. 2013. Lepismium houlletianum. The IUCN Red List of Threatened Species 2013: e.T46521A3007880. http://dx.doi.org/10.2305/IUCN.UK.2013-1.RLTS.T46521A3007880.en. Downloaded on 13 April 2016. 7) Taylor, N.P. and Zappi, D.C. “Cacti of Eastern Brazil.” Royal Botanic Gardens, Kew. 2004. Cultivation and Propagation: Lepismium houlletianum is among the easiest to cultivate epiphytic cacti and tolerates neglect. This cactus, being a native of the forests of Western Brazil, naturally requires different treatment from the desert cacti. It can grow up to 180 cm long when staked; it can also be grown in a hanging basket, which is more natural since it is an epiphyte. This cactus is green under ideal growing conditions but blushes red when stressed. Give it more heat or cold, less water or fewer nutrients, and you'll get that beautiful hue. Soil: These cacti won't want a normal cactus soil but will prefer to be in a soil largely composed of organic material, such as peat, sphagnum moss or leaf-soil, kept open by plenty of sharp sand or pumice grit. This type of soil would normally be used for orchids, bromeliads or other epiphytic plants. Regular potting soil is also fine as long as it drains well. PH, preferably about 5.5 to 6.0. Fertilization: It will want occasional doses of dilute fertilizer. Generally it is not suggested the use of manure for cacti, but in this case the addition of a quantity of old cow manure is beneficial and produces luxuriant growth. Hardiness: Lepismium houlletianum is not frost-hardy and won't tolerate desert heat, but it thrives in coastal gardens. It needs night-time temperatures no cooler than 5° C, especially in the winter. In summer it need warm but not hot temperatures, preferably under 27° C. As it flowers during winter it should not be dried off like desert cacti but needs watering throughout the season. A resting period is not needed. Uses: Grow lepismium in a flat-backed pot against a light-coloured wall to show off the plant's striking color and spider-like explosion of scalloped leaves. Or use it as a cascading element of a potted composition with other succulents. These forest cacti tend to be long lived.